No doubt you have heard about the scandal which prompted the resignation of America’s top spy, CIA Director David Petraeus. 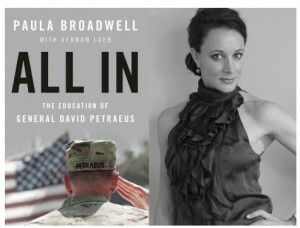 The celebrated retired Army general stepped down after confessing to an extramarital affair with his biographer Paula Broadwell. The downfall came when the two got caught exchanging secret love letters through an email account, but as you can read from any news source, the plot continues to thicken. According to a law enforcement official investigating the case, Petraeus and Broadwell adopted a trick used by al-Qaida terrorists and sneaky teenagers to conceal their illicit correspondence. They composed emails in an anonymous Gmail account, but instead of sending them, they left the messages in the draft folder. That way, they could read and respond to messages without leaving anything to track. Well, as we know, nothing stays private for very long on the interwebs. Google, Yahoo and other internet providers regularly pass on information to authorities who come knocking with subpoenas and warrants. A subpoena is usually sufficient to require internet companies to reveal names and any other information that could identify the owner of a particular email account. Google, which operates the Gmail email service, reports it complied with 90% of over 16,000 government requests to obtain private user information in the first half of this year. Even if your emails don’t pose a risk to national security, you still want to keep them as secure and private as possible. Use strong passwords - Use different passwords for each of your online accounts so if one is compromised the rest are safe. Strong passwords contain letters, numbers, different cases, and symbols. If you can’t be bothered with remembering multiple passwords, use a password manager such as avast! EasyPass. You access all your passwords using one Master Password. Create a secondary email address for spam – You usually have to share your email address when signing up for new accounts, newsletters, or when making online purchases. It’s good to use a secondary email address so if the website shares it with marketers or third parties, without your permission, your primary email account will not be flooded with spam or potentially malicious emails. Log out of Public PCs - When using your email account on a public computer in a library or internet café, make sure you've logged out before leaving. Be cautious when opening emails - The avast! Mail Shield scans all incoming and outgoing email and attachments for malware, but you should still be wary of emails sent from individuals or businesses you do not recognize. Never download attachments from unknown senders, because they can contain viruses or malicious software that can take over your computer and/or harvest your personal information. Stay on top of security issues, ask questions, make comments, or just say hello on our avast! Antivirus page on Facebook. Over 2 million people have “liked” us. Please Like avast! today.